SET: NECKLACE - SARAH COVENTRY. "FLATTERY" FROM 1974. 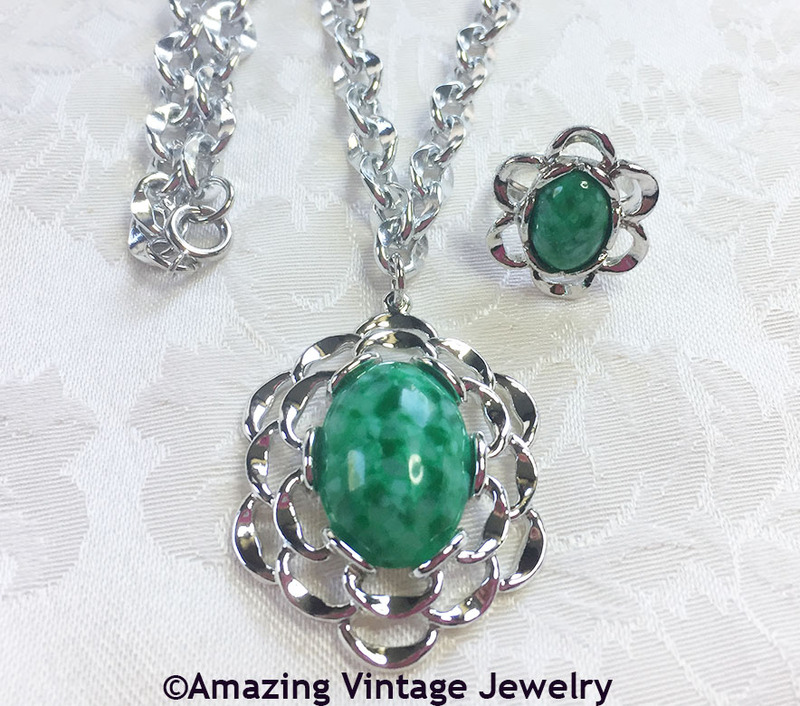 SILVERTONE LOOPS WITH GREEN MARBLED INSET COMPLIMENT ANY OUTFIT WITH THIS LITTLE TOUCH OF COLOR.. PENDANT IS LARGE, 1 7/8" LONG, 1 9/16" ACROSS. CHAIN IS 24" LONG AND IS VERY LIGHT WEIGHT. VERY GOOD CONDITION. RING - SARAH COVENTRY. "FLATTERY" FROM 1974. 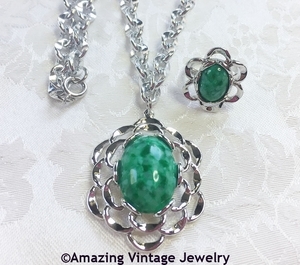 SILVERTONE LOOPS WITH GREEN MARBLED INSET COMPLIMENT ANY OUTFIT WITH THIS LITTLE TOUCH OF COLOR. ADJUSTABLE. RING TOP IS 1" LONG, 7/8" ACROSS. VERY GOOD CONDITION.